Home » Who Won MKR 2017? It is the MKR Grand Final, Amy & Tyson vs Valerie & Courtney. Who won MKR 2017? Find out who the winner is and what their score first here. 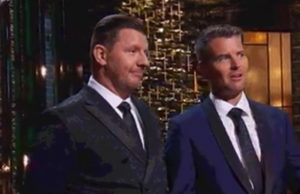 It has been a long journey through the My Kitchen Rules Season to the MKR Grand Final, who will win this final cook off? Amy & Tyson are dressed in black aprons and have to cook in their instant restaurant “Mosaic”. Valerie & Courtney are in the white aprons and are cooking in their instant restaurant “Tiffin Room”. Both teams get off to a strong start. When the timer counts down to 1 hour remaining, their restaurants open and the guests arrive. It is their family and friends. The teams start plating up. Tyson uses an aerated gun to pipe the mousse and Amy grates white truffle over the top, meanwhile Valerie & Courtney are rushing, they are putting the last pieces of pomegranate on the plate. Both teams plate up their first dish of the MKR Grand Final. They take the dishes to the judges. The first dish to be tasted is Valerie & Courtney’s Samosa Crisp. Guy says it was a “zingy little number”, it puts him in a sophisticated Indian restaurant. Karen says it is “sheer brilliance”. Manu likes the different layers of flavour. Next, Amy & Tyson’s Mousse is tasted. Colin says it is packing a flavour punch, it is a celebration. Liz says it is grand final food, a beautiful, elegant start. Pete says something crispy would have elevated the dish but it was very near perfect. Both teams use this round to get the frozen elements of their desserts into the freezer. Both teams are making a type of Pea soup in this round. Who will win the battle of the soups? It is the first time Tyson has cooked with pork back fat, will it be a perfect dish? Both teams plate up, Valerie painstakingly balances roe on top of her salmon skewers, time is up. The judges taste Amy & Tyson’s pea and ham soup first. Colin says it is a refined dish, perfectly cooked crackling, Pete likes the back fat and says it is a faultless dish. Next they try Valerie & Courtney’s skewers. Karen says this pea soup is delicious, it is refreshing a sweet and works perfectly with the salmon. Liz agrees, the salmon is cooked perfectly. Guy likes the fresh, fragrant aroma. At this point, it is neck-a-neck, who will win My Kitchen Rules 2017? It is on to the third course. Amy & Tyson are making Marron and Valerie & Courtney are making Mackerel. Amy is worried about the artichoke but Valerie cuts into her mackerel and its raw, with 10 minutes to go, its back into the pot. Will they plate up in time? It was a tough round, but is their mackerel cooked? They raced to the end and some of their dishes aren’t plated perfectly. The dishes are taken to the judges. They start with Amy & Tyson’s Marron. Guy says the marron is cooked really well, the sauce adds richness. Liz likes the addition of the artichoke and rhubarb it is unlike anything she has eaten. Manu says everything they have ever asked for is in the dish. Next is Valerie & Courtney’s Mackerel. Pete says the standout in the dish is the sauce. Karen enjoyed the finger lime but Guy thinks the balance is a bit out. He would have preferred the rice to be separated as it has made the dish a bit dry. After this round, could Amy & Tyson win tonight? The contestants have 90 minutes to deliver the fourth course. Valerie & Courtney are making pork vindaloo and Amy & Tyson are making veal, sweetbreads and marrow. This is the second last round. Valerie is getting stressed, Amy & Tyson are powering through but their dish is very complex. Tyson is struggling with breadcrumbs, they won’t blend and it is costing him time. It’s coming to plating, Valerie & Courtney have a lot of elements, one of which (the papadum) they didn’t make themselves. Amy & Tyson are strapped for time, they have to get their dish plated, it looks a bit messy. Meanwhile Valerie & Courtney’s plate looks amazing. The first dish to be tasted is Valerie & Courtney’s vindaloo. Guy says the vindaloo is wonderful, it has so much flavour and all the condiments are executed well. Karen loves the curry. Pete says it is a confident dish. Amy & Tyson’s dish is next. Colin says he has seen this dish many times in many restaurants and it is cooked as good. Manu loves the sauce, it brings the elements on the plate together. Karen says the veal was perfectly cooked, she says it is the best dish for her in 8 years. It is the final round before we find out the My Kitchen Rules 2017 winner. Is it over? Have Amy & Tyson won My Kitchen Rules 2017? We are about to find out. The first dish to be tasted is Amy & Tyson’s after dinner mint. Liz says the sorbet is spectacular, the dish is faultless for her. Colin says this dish made him happy, it was refreshing and cleaned the pallet. Pete says its perfection. Next is Valerie & Courtney’s Kulfi. Karen says the dish is refreshing and playful and she enjoyed the crumb. Manu says it has a beautiful texture, an amazing way to finish a meal. It is down to the scores, who will win My Kitchen Rules 2017? The winner of My Kitchen Rules 2017 is Amy & Tyson. Valerie & Courtney cooked a good menu, but having received 10’s from some of the judges, Amy & Tyson have won My Kitchen Rules 2017. ← Semi Final 2 – Tim & Kyle vs Valerie & Courtney who wins MKR?